(CNN) -- Al Qaeda's second-in-command slams the "smiling Obama" and threatens attacks in the latest video posted on radical Islamist Web sites. 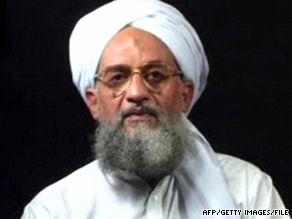 Ayman al-Zawahiri's video message was filled with threats. Ayman al-Zawahiri uses the message to eulogize Ibn al-Sheikh al-Libi, an accused terrorist who said he was tortured into making a false connection between al Qaeda and Iraq. Human rights monitors said in May that he had died. "Obama claims to respect human rights and condemn torture, and here I will not ask him about the expansion of the Bagram prison, and will not ask how he forgave the crimes of the CIA executioners. I will not ask him about his decision not to release the detainee abuse photos and will not ask him about the program to hand over detainees to other countries to be tortured, and will not ask him about the assassination teams that are deployed to assassinate anyone who is suspected to be an extremist," al-Zawahiri says in the message. He refers to al-Libi as "a veteran fighter in repelling the attacks of the hypocrite agents who were working for the crusaders against the mujahedeens." Islamic radicals use the term "crusaders" to refer to Christians and the West. Al-Zawahiri's message was filled with threats similar to those seen in past messages. "It will be about your blood and the draining of your economy until you stop your crimes, you arrogant tyrants," he says, according to a CNN translation. Octavia Nasr, CNN's senior editor for Middle East affairs, said, "This falls within al Qaeda's propaganda and its continued attempts to keep itself relevant. In a climate where al Qaeda's effectiveness and capability to carry out attacks are being questioned, the organization continues to pump propaganda videos where al Qaeda leaders take turns eulogizing members killed in attacks or in jail."